The Olympus 40-150mm f-2.8 PRO lens (80-300mm in 35mm equivalent) is the first telephoto in the M.ZUIKO PRO series to feature dust, splash, and freeze proof construction. Mount it on the OM-D E-M1, and you have a powerful pro rig that weighs far less than its DSLR cousins. Specs include: 16 elements in 10 groups, 9-blade aperture, 72mm filter ring, two high-grade lens elements using dual linear VCM (Voice Coil Motor) motors, minimum focusing distance of 20 inches, dedicated function button, sliding lens hood, and it's just over 6" in length. The M.ZUIKO DIGITAL ED 40-150mm f2.8 PRO Lens will be available in Nov. 2014 for $1,499. Need more reach? 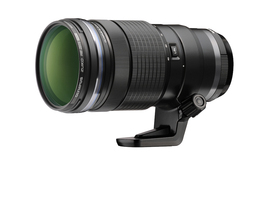 The MC-1.4x teleconverter boosts the zoom range of the 40-150mm f-2.8 PRO lens to a 420mm equivalent. It offers the same dust, splash, and freezeproof build quality of the PRO Series zoom. The MC-14 1.4x Teleconverter will be available in Nov. 2014 for an estimated street price of $349.